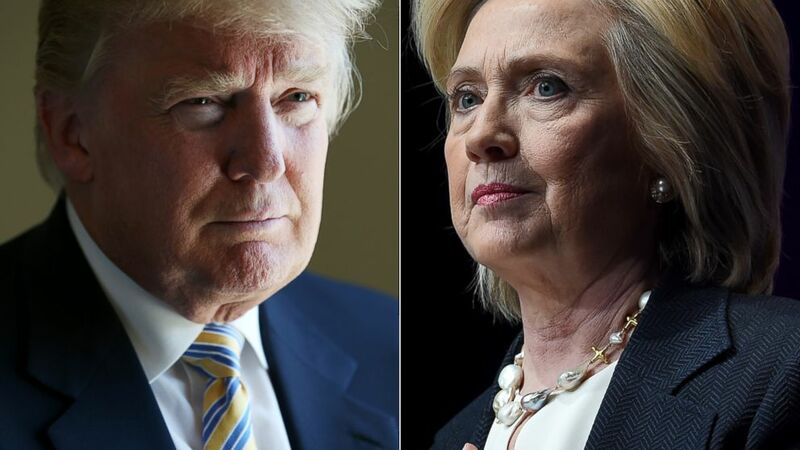 The Immelman Turn » Blog Archive » Who Will Win the Clinton-Trump Presidential Debate? Who Will Win the Clinton-Trump Presidential Debate? Tonight, Democratic front-runner Hillary Clinton will face off against Republican challenger Donald Trump in the first presidential debate of the 2016 election cycle at Hofstra University in New York, in front of an anticipated record-setting 100 million television viewers. As is customary in presidential debates, analysts and commentators likely will pick a winner and a loser. But while the political pundits attach inordinate value to rational considerations such as the candidates’ command of policy details, the judgment of the average viewer tends to be far more impressionistic, driven by perceptions of the candidates’ personal qualities. The American National Election Studies (ANES) identified four facets of voter evaluation with respect to presidential character traits – competence, leadership, integrity, and empathy – and since 1984 have asked respondents to rank presidential candidates on those traits. According to political psychologist Donald Kinder, voters initially screen presidential candidates on the “statesmanlike” traits of competence, leadership, and integrity, and once the statecraft issue is settled look for empathy (warmth and compassion). So, how to the contenders stack up on presidential mettle, based on political experience and their personal psychology? Clinton has a demonstrable track record of competence in the political arena, though Trump has actively undermined Clinton’s reputation by defining her as an abject failure in foreign policy. 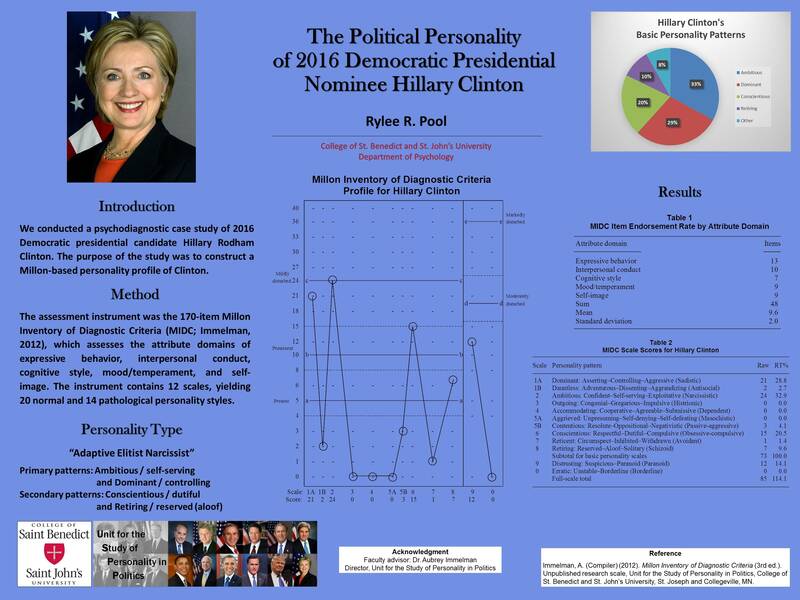 However, in the personal department, Clinton outscores Trump on the Millon Inventory of Diagnostic Criteria’s (MIDC) Conscientiousness scale (Clinton = 15; Trump = 0), a psychological measure of competence. As expected, Trump hammered Clinton on trade- and foreign policy failures; however, Clinton retained her composure and was largely successful in fending off Trump’s attacks. Also as anticipated, Clinton displayed superior debate preparation and ability to stay on-message, whereas Trump became increasingly undisciplined and unfocused towards the end of the debate. As a former United States senator and secretary of state, Clinton undeniably has more experience in the realm of political leadership, though Trump has touted his own success as a business leader. Psychologically, Clinton has a very slight edge over Trump on the MIDC’s Dominance scale (Clinton = 21; Trump = 17), a quality that voters typically perceive as reflecting strong leadership. Clinton not only displayed her political leadership experience but succeeded to a significant degree in undermining Trump’s reputation as a successful business leader. Trump scored points in noting that if Clinton hadn’t been able to fix America’s problems in her long political career thus far, there was no plausible reason to believe she would suddenly start now. 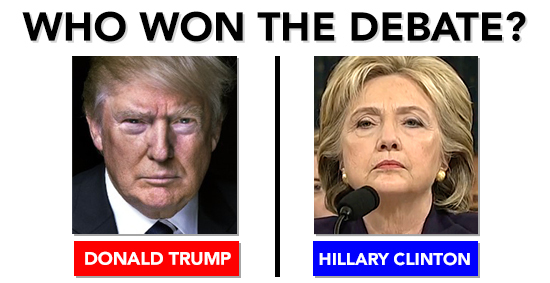 Clinton dominated the latter part of the debate, often forcing Trump to play defense. It can be said with little risk of hyperbole that both candidates appear ethically challenged. The most reliable MIDC indices of integrity are low scores on the scales of Ambition (a measure of narcissism) and Dauntlessness (risk-taking). 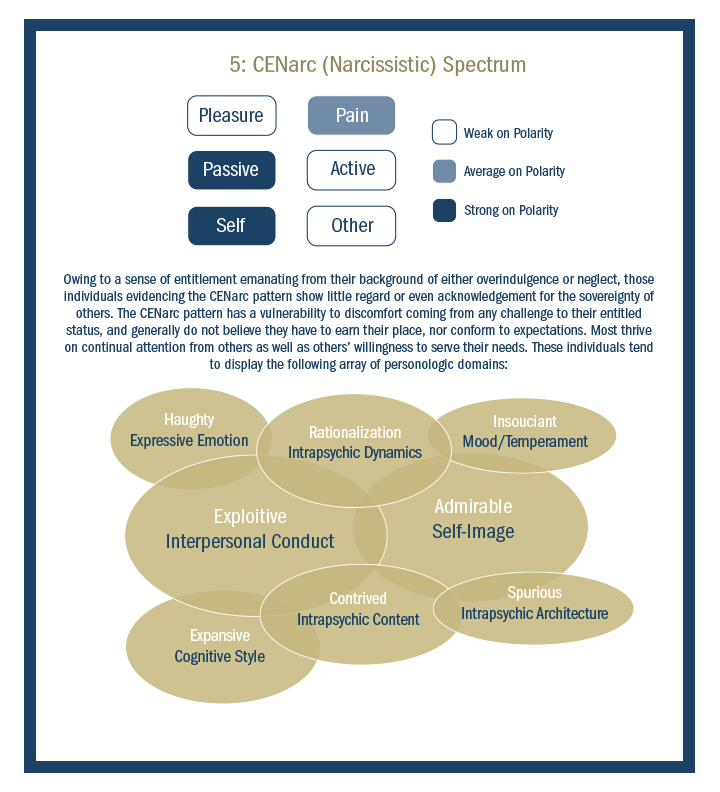 Clinton and Trump have identically elevated scores of 24 on the narcissism measure, but Clinton is the clear winner on risk aversion (Clinton = 2; Trump = 9). It is noteworthy, however, that Trump has been more successful on the campaign trail in framing “Crooked Hillary” as being dishonest. Clinton was more effective calling into question Trump’s business dealings than Trump was in highlighting Clinton’s ethical lapses and negligence with respect to her private email server. In part, that was due to Trump lacking the discipline to follow through on the email issue and apparently being unprepared to mount an effective attack on Clinton regarding the FBI probe of the email issue. Missed opportunity Trump; Clinton steals third. Based on their respective MIDC scores, neither Clinton nor Trump can be characterized as compassionate; however, Trump has the requisite personality traits to project a warm, empathic political persona. The most direct MIDC measure of empathy is the Accommodating scale, a measure of likableness on which both Clinton and Trump flatline with a score of zero. However, Clinton is no match for Trump in the ability to project empathy. 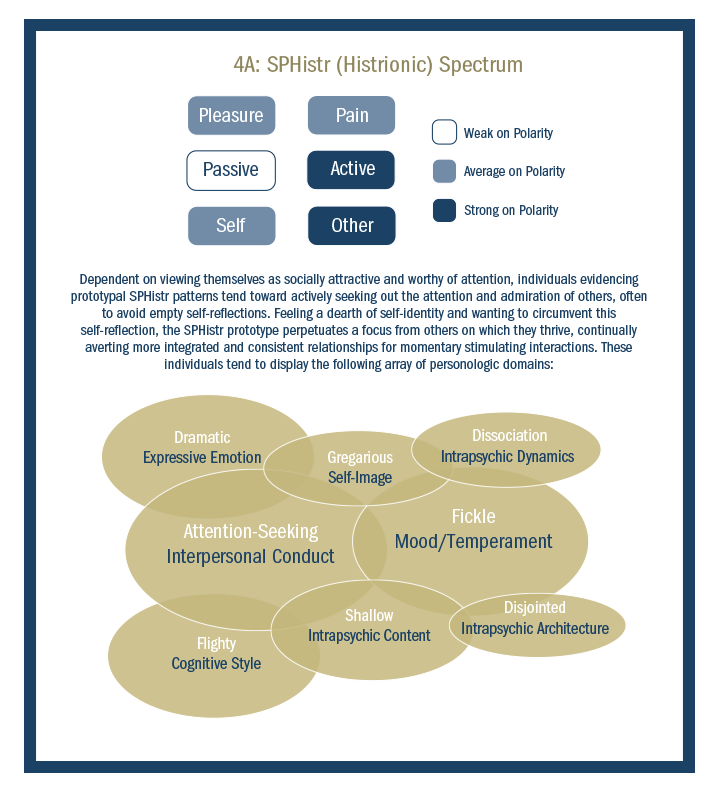 Specifically, Trump outscores Clinton 24 to zero on the MIDC Outgoing scale, a measure of extraversion, energy, and social intelligence – the so-called “beer test” of likability. Trump clearly attempted to conjure up a more compassionate persona; however, he was too easily baited by Clinton and at times allowed her to get under his skin. In addition, he responded to a question on race relations with an argument about law and order. Clinton, purely by dint of superior debate preparation, discipline, and remaining measured and composed — emotional intelligence — successfully prevented Trump from presenting himself as the more likable candidate. Unforced error Trump; Clinton scores run. Clinton will step onto the stage with a clear advantage on “statesmanship” traits of perceived competence and leadership, which gets her to first base. If she can maintain her edge in this veritable “World Series” of presidential politics by demonstrating a superior grasp of policy details and fitness to lead, it should be good enough to get her to second. But from here on it only gets harder for Hillary. The debate moderator can retire Clinton with a force out on a “gotcha” question regarding her honesty, or Trump can tag her out with a rhetorical counterpunch on the character issue. Scorecard: No “gotcha” question (or follow-ups) from the debate moderator; Trump unprepared to follow through on the email issue; Clinton steals third. Assuming Clinton manages to steal third, thereby clearing the statecraft hurdle, it’s hard to imagine any scenario in which she can overcome the final psychological barrier to scoring the winning run by presenting herself as warm and likable. Scorecard: Turns out Clinton did not have to present herself as warm and likable. By merely being well prepared, maintaining message discipline, and retaining her composure, Clinton edged out Trump. Clinton scores. For Clinton to win, Trump would have to disqualify himself on the grounds of fitness to govern and presidential temperament, thus forfeiting the game. Scorecard: Trump was generally successful in restraining his volatile temperament and thus did not disqualify himself on the grounds of fitness to lead; however, consistent with his personality profile, he was inadequately prepared and too undisciplined. Trump forfeits Game 1 in the series. By the same token, if Clinton has another coughing fit or fainting spell, it could be game over in a series-ending strikeout. Scorecard: No evidence of health issues on Clinton’s part; in fact, Trump was the one who seemed more fatigued by the end of the debate. 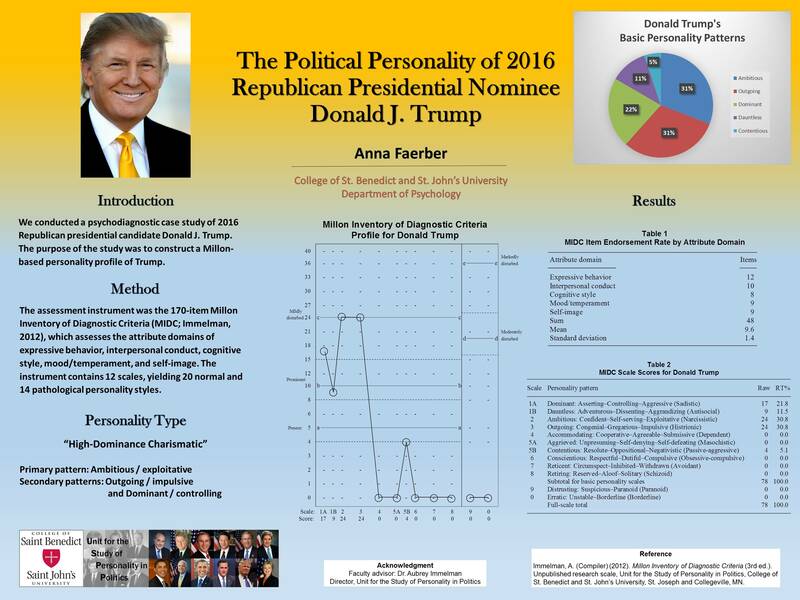 Analysis by Aubrey Immelman, Ph.D., Unit for the Study of Personality in Politics.